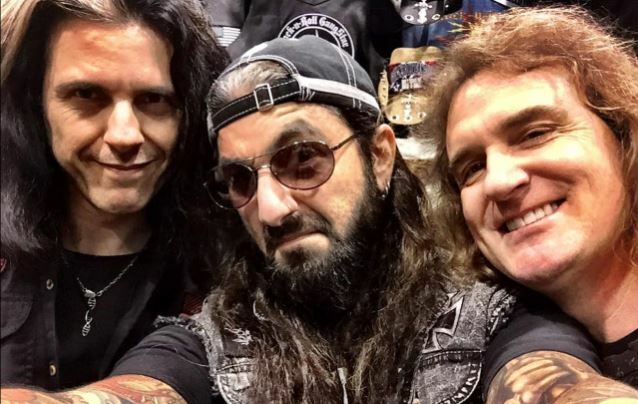 METAL ALLEGIANCE — the all-star metal band consisting of a rotating cast of musicians, including members of MEGADETH, TESTAMENT — which debuted on MOTÖRHEAD's Motörboat cruise last year, and performed at this year's NAMM show and on the ShipRocked cruise, has signed a deal with Nuclear Blast Entertainment. The group's debut album will be released this fall. 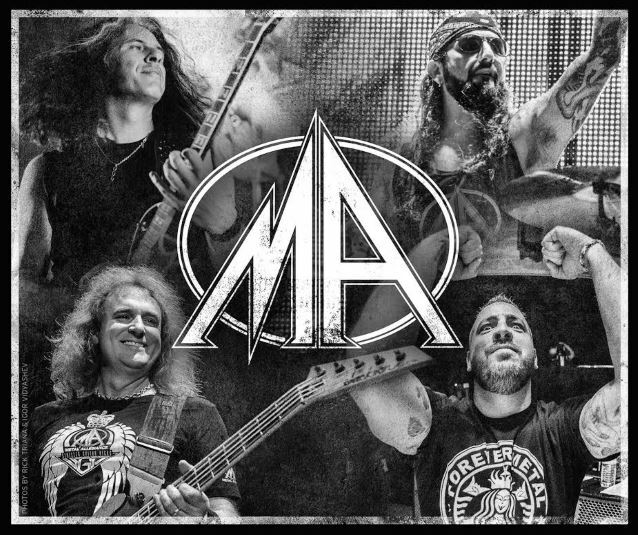 Brought together by METAL ALLEGIANCE principal partner Mark Menghi, the project's original material came together from the creative minds of David Ellefson of MEGADETH, Mike Portnoy of THE WINERY DOGS, and Alex Skolnick from TESTAMENT, alongside Menghi. The four writers then reached out through their metal rolodexes to a diverse lineup of performers, each adding their own personal musical stamp to the collection of nine original songs. "I am incredibly fortunate to be able to work with legendary musicians and personal heroes like David Ellefson, Alex Skolnick and Mike Portnoy, as well as METAL ALLEGIANCE founder Mark Menghi," he said. 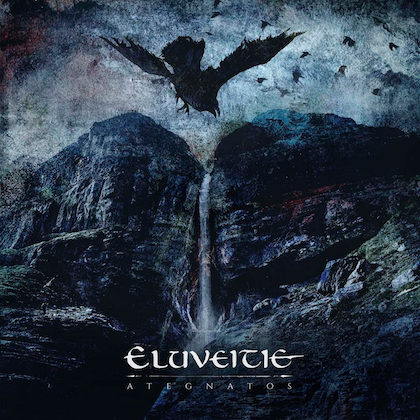 "These guys wrote an amazing and diverse record that is 100 percent pure metal, and lined up some killer guest vocalists and lead guitarists to bring it home in an epic, shredding fashion — just the leads on this record alone will blow people away!" he said. "Perhaps the coolest part of all is that unlike similar projects in the past that existed as studio-only creations, METAL ALLEGIANCE were a touring entity first and have now organically evolved into a studio band that makes albums. I am very grateful to these guys for choosing me and the Nuclear Blast team as the vehicle to bring their music to the metal masses." Stemming from an initial idea in 2011, METAL ALLEGIANCE was born as a way to unite a collection of hard rock and heavy metal's most notable musicians in a setting born under one ideal, a love of music and performing. In 2015, that ideal still holds true and has become the foundation for everything METAL ALLEGIANCE; furthered with the release of the upcoming debut album. While the lineup may change, the passion, the energy and the emotion all remain the same. METAL ALLEGIANCE is more than just a record or a concert, it’s an experience and a lifestyle. Previous participants in METAL ALLEGIANCE live events have included Philip Anselmo and Rex Brown (PANTERA); Joey Belladonna, Frank Bello, Charlie Benante and Scott Ian (ANTHRAX); Gary Holt, Kerry King and Dave Lombardo (SLAYER), Chuck Billy (TESTAMENT); Troy Sanders (MASTODON); and Andreas Kisser (SEPULTURA). These unforgettable events have also spawned surprise appearances by the likes of Geezer Butler (BLACK SABBATH), Phil Campbell and Mikkey Dee (MOTÖHEAD), Steve Vai and Billy Sheehan (THE WINERY DOGS). Portnoy recently told Loudwire about METAL ALLEGIANCE: "There's this misconception that it's my metal project, which it's not. This is something that I am working in equal collaboration with [Ellefson] and [Skolnick]. It's our project." He added: "It's a great, great metal album that the three of us have written and recorded together, and we're gonna have lots of various other friends and special guests joining us on it. And more info to come, but, for me, it's a great, great metal outlet, because… Since I left DREAM THEATER, I've had prog bands and classic rock bands and alternative things, but I haven't had a true, true thrash metal-oriented outlet — other than the METAL ALLEGIANCE shows that I've done, but that's live. So, yeah, it's exciting for me." Portnoy previously told MikePortnoyWarriors.com about METAL ALLEGIANCE: "For me, I'm getting to do the full-blown, double-bass shredding drumming that I've only been able to hint at with DREAM THEATER or with AVENGED or with ADRENALINE MOB. So now it's a full-blown album. And the whole album is not thrash. 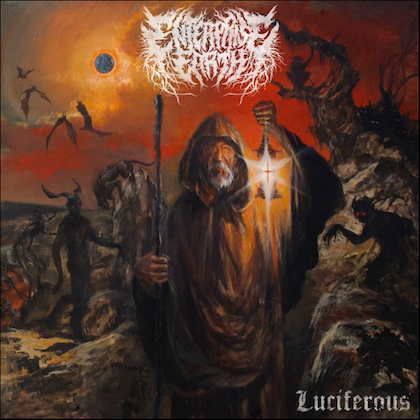 I mean, this album is really kind of the history of metal; there's moments that are early metal, like very [BLACK] SABBATH-esque, and then there's moments that are full-on mid-'80s thrash — EXODUS, SLAYER, early METALLICA, 'Kill 'Em All' METALLICA — so there's a good chunk that's very, very much like that. And then there's moments that get more into '90s type of ALICE IN CHAINS sort of stuff. 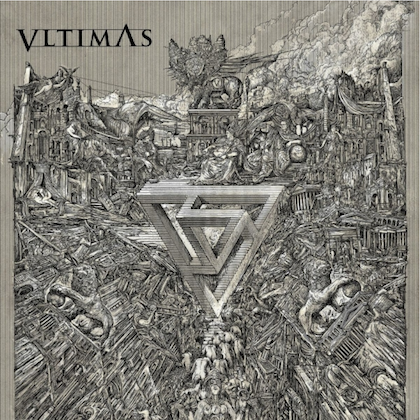 So it's almost a good history-of-metal sort of album. But I definitely have gotten my metal chops in. It's been fun. It's been really, really cool. I can't wait for people to hear this album." Regarding how he fits alongside other METAL ALLEGIANCE members, Portnoy said: "To me, METAL ALLEGIANCE is… it's the ultimate hang. And, for me, it's awesome, because I'm really the only guy on the roster that's not normally in a thrash or metal band; I come from a kind of different world. So, on the outside, it may look weird that I do this, but I've always been the biggest metal fan through and through. I grew up listening to the same stuff as all these guys — we all grew up listening to [BLACK] SABBATH and [JUDAS] PRIEST and [IRON] MAIDEN and KISS and AC/DC and MOTÖRHEAD — so I have the same musical background as these guys. And once all the guys in METAL ALLEGIANCE were coming up — in MEGADETH and SLAYER and PANTERA and ANTHRAX — I was coming up around the same time as well, just in a different genre. But these guys were always my friends; I was always hanging out with the ANTHRAX guys and the PANTERA guys… whatever. I felt a close kinship to all the guys in this thrash world, and they became my friends. So, with METAL ALLEGIANCE, for me, it's a natural thing to be involved with these guys. All these guys are great guys, great friends. We love jamming together, and the whole METAL ALLEGIANCE thing is just… You know, we're fans. When we're up on stage playing this stuff, we're as much fans as the people on the other side, in the audience. We're on the side of the stage headbanging and cheering everybody on and having a good time. So that's what it's about: it's just metal by metal guys who are still metal fans."